Magor Csibi brings to WWF a fresh perspective, experience and savvy that will help us lift our work in Romania to a higher level. 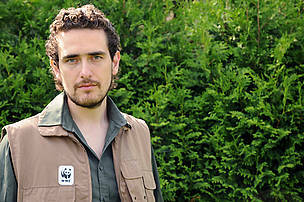 Before coming to WWF he spent time as Member of the European Parliament, and in the past couple of years built a successful internet site devoted to sustainability and other issues. You've been at the job for almost one month now. What is your first impression of the work ahead at the WWF Danube-Carpathian Programme, Romania? In the past couple of weeks I've had the opportunity to get used to the idea that now “I am a panda”. I have become a part of what has been a dream organization for me since I was a child. I still can’t say that I know very well everyone here or the organization, but my first impression is overhelmingly positive. The staff is motivated and extremely competent, not to mention kind. The programmes we run are relevant, so I can say that I found a good situation. There are also a couple of weak points – for example WWF in Romania is known by only 3% of the Romanians, but I think that we will be able to get past all challenges and become one of the most relevant actors in the field of environment in our country. What do you think are the most pressing environmental issues in our region today? How would you go about solving them as a head of the WWF programme in Romania? Unfortunately we have a lot of pressing issues in the field of environment and we need to limit ourselves to only a couple. I might be a little bit subjective, because my childhood was strongly connected to forests, but I would put forestry as one of the most important issues in the region. Forests are vital, not just from biodiversity and envrionmental point of view, but also as the backbone of several key regions in Romania. We also have a great deal of work to do on wetland conservation and water management in general, issues which are traditionally ignored by most of the country’s administration. As head of the WWF programme in Romania, I consider myself extremely lucky, because our team leaders and conservation staff are extremely well prepared and efficient. They have been doing an incredibily good job for some time. As I see it, I need to let them continue and help them in the field of communication, advocacy and policy making. Two years from now, what would you like to have achieved? First of all, I would like to see that WWF in Romania becomes known to the larger public. Raising awareness is important not just from the organization’s point of view, but it can be a good tool to promote projects, to change lives and lifestyles and to educate. I would also like to see that all our staff stay with us and remain motivated. Our programmes and projects are improving the skills of our colleagues all the time and their expertise will become more and more precious for the organization and for the quality of our work. So we need continuity. Last but not least, I would like to see more active supporters. We will strive to ensure that donating becomes a more familiar concept to Romanians, and we will do our utmost to prove to people that small things can make big changes. The memory of my childhood is very strong and even if I'm fairly young, I already miss the times when we respected each other and the things around us. Even though I am an incurable nostalgic, I became this always rushing, always busy, always engaged person. Over the last couple of years I tried to find a good balance. I started my carreer teaching at my Alma Mater (Babes-Bolyai University, Cluj Napoca), after I succesfully graduated from the Political Science Faculty and finished a masters programme in Management of Political Parties. I quit my PHD studies because I decided that I was not prepared to become a "Doctor of Philosophy". Quitting university brought me a new challenge. I became the advisor of the President of the Chamber of Deputies in Romania. I also entered politics, and shortly became the second youngest member of the European Parlament and vice-chair of the environment committee. Finishing my mandate, I realized that I had doubts about the change politics can generate, so I left the party I was a member of. I decided to try journalism, so I created Think Outside The Box, an online newspaper on environment. Today TOTB is well known in Romania and is read by about 200,000 Romanian and Hungarian speaking people from Romania. I did not hesitate to join WWF - without abandoning my journalistic project - and I hope to have a long and fruitful history here. I don't think of myself as a manager. I think that creativity and implementing creative ideas are the most important assets of an organization, so I try to be creative, to generate ideas and to help people to come up with ideas that can be implemented through teamwork. I believe that people in general don't need a management body that dictates to them what to do, instead they need a management body which creates for them ideal conditions in which to be able to create and work. I go to the gym 3-4 times per week, I run, cycle and skate every time I have the opportunity. I love to travel, but I need my time for this, so usually if I go somewhere I make sure that I have at least a couple of weeks to be able to observe as musch as possible. "I would like to see that WWF in Romania becomes known to the larger public".